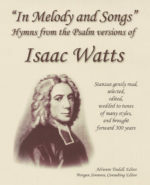 See and hear the beauty of “lost” versified psalm texts written by Isaac Watts. “The Father of English Hymnody,” updated and set to new tunes by composers of today. Indexes of the Watts stanzas included, showing his own 1719 “updating” of the psalms. The 104 settings, in many musical styles, were written to capture and express the essence of each test.